Limited edition of 444. Includes hand-numbered certificate. Mirage-Tape-Years features music from Carl Matthews's early cassette releases. 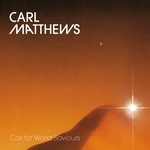 Music has always been important to Carl Matthews. Especially the German music he got into right from the start, buying albums from Virgin Records in London of bands like Cosmic Couriers, Klaus Schulze, Guru Guru and Amon Duul II. Given that his friends found his music taste a bit disturbing, Carl decided to do his own stuff to give him the freedom to do music he really loved i.e., electronic music. He bought a reel-to-reel, a Korg Polyphonic Ensemble, a Korg MS20 synthesizer and a Korg SQ10 Sequencer. All very limited compared to today's technology but good and interesting sounds could still be produced. Carl produced his first tapes and they found release on labels and distribution outlets. Some of the tracks on this album are from the very first releases Intervention 87 (1981) and Freewheel To Freedom (1981), which were more experimental and minimal incorporating guitar sounds. Other tracks off the albums Aksu (1980), East/West (1981) and Iridescence (1983).